Kevin started practicing yoga in his late teens, immediately after a period of massive (less than healthy) weight loss, and just before he (finally) came out of the closet. During the struggle to adapt to a new physical and emotional reality, yoga provided a pathway to organize the chaos. Over the past thirteen years of study, the practice has continued to be his saving grace; he teaches with the hope that his offering affords students the same benefits and opportunities for growth he's received from his teachers. 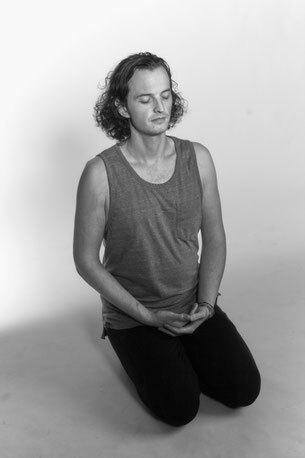 Kevin completed his first teacher training with Boston's Radiant Yoga School (Chanel Luck & Bonnie Argo) and was later whipped into proper shape by Schuyler Grant and all of the rad senior teachers at Kula Yoga Project here in New York. He currently studies with Iyengar Yoga teacher Nikki Costello (including The Enrichment Practice, a 300-Hour Advanced Teacher Training). At Om Factory, Kevin co-created OFSY's Aerial Yoga Teacher Training Curriculum and is one of the lead teachers for the 200-Hour Vinyasa Teacher Training as well. In addition to his regular Vinyasa and Aerial Yoga classes at the studio, he has led trainings for Om Factory in Connecticut, China, South Korea, Taiwan, and Vietnam. When Kevin is not teaching or leading trainings at Om Factory, you might catch him hosting a workshop!